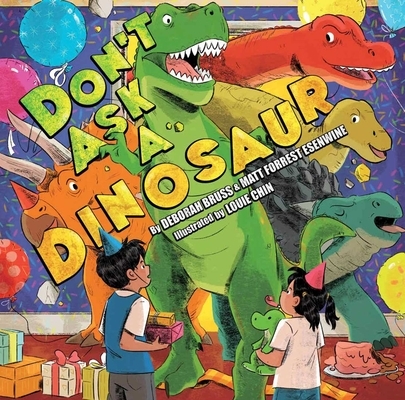 Don't Ask a Dinosaur is about a party that goes wildly awry when a pack of dinosaurs with very unique physical attributes attempt to help set up. Written in a masterfully-executed rhyme, the book presents a cavalcade of lesser-known dinos and pairs their odd characteristics with little tasks that are hilariously impossible because of those features. "Don't ask Deinocheirus to set the forks and spoons," because his hands were enormous, "Therizinosaurus cannot blow up balloons," because he had very long claws. In the end they find the one thing everyone can help do is to blow out the candles on the cake...but will it create yet another mess? Matt Forrest Esenwine has had several adult poems published in independent collections around the country, and in 2012 his poem, “Apple-Stealing,” was nominated by the Young Adult Review Network (YARN) for a Pushcart Prize. Meanwhile, his children’s poetry can be found in numerous anthologies including Kenn Nesbitt’s One Minute till Bedtime (Little, Brown Books for Young Readers, 2016), Lee Bennett Hopkins’ Lullaby and Kisses Sweet (Abrams Appleseed, 2015), and J. Patrick Lewis’ The National Geographic Book of Nature Poetry (National Geographic Children’s Books, 2015), among others, as well as “Highlights for Kids” magazine. Born just outside of Baltimore, MD, Matt lives in Warner, NH with his wife and kids. Some children know what they want to be when they grow up. Not Deborah Bruss. Her passion for writing did not develop until after she had read thousands of pages out loud to her two boys. Once she discovered a love of writing for children, her career took off. She has written humorous, educational pieces for a newspaper on subjects ranging from a porcupine bent on revenge and some seasick children on a whale watch, an award winning picture book, and a board book too. For six years she also worked as a librarian at a small public elementary school, and is also collaborating on an historical fiction middle grade novel. In 1999, Deborah, her husband and two sons adopted two girls. All of her children have grown up. She now lives in Concord, NH, with her husband and rescued-dog.